There are various scenarios in which you'd want to move your existing Azure IaaS virtual machines (VMs) from one region to another. For example, you want to improve reliability and availability of your existing VMs, to improve manageability, or to move for governance reasons. For more information, see the Azure VM move overview. You can use the Azure Site Recovery service to manage and orchestrate disaster recovery of on-premises machines and Azure VMs for business continuity and disaster recovery (BCDR). You can also use Site Recovery to manage the move of Azure VMs to a secondary region. This tutorial shows you how to move Azure VMs from one region to another as is. If you need to improve availability by moving VMs in an availability set to zone pinned VMs in a different region, see the Move Azure VMs into Availability Zones tutorial. Make sure that the Azure VMs are in the Azure region from which you want to move. Verify that your choice of source region - target region combination is supported, and make an informed decision about the target region. Make sure that you understand the scenario architecture and components. Review the support limitations and requirements. Permissions to manage Azure Site Recovery operations. The Site Recovery Contributor role has all the permissions that are required to manage Site Recovery operations in a Recovery Services vault. Make sure that all the latest root certificates are on the Azure VMs that you want to move. If the latest root certificates aren't on the VM, security constraints will prevent the data copy to the target region. For Windows VMs, install all the latest Windows updates on the VM, so that all the trusted root certificates are on the machine. In a disconnected environment, follow the standard Windows Update and certificate update processes for your organization. For Linux VMs, follow the guidance provided by your Linux distributor to get the latest trusted root certificates and certificate revocation list on the VM. Make sure that you're not using an authentication proxy to control network connectivity for VMs that you want to move. If the VM that you're trying to move doesn't have access to the internet, or it's using a firewall proxy to control outbound access, check the requirements. Identify the source networking layout and all the resources that you're currently using. This includes but isn't limited to load balancers, network security groups (NSGs), and public IPs. Verify that your Azure subscription allows you to create VMs in the target region that's used for disaster recovery. Contact support to enable the required quota. Make sure that your subscription has enough resources to support VMs with sizes that match your source VMs. If you're using Site Recovery to copy data to the target, Site Recovery chooses the same size or the closest possible size for the target VM. Make sure that you create a target resource for every component that's identified in the source networking layout. This step is important to ensure that your VMs have all the functionality and features in the target region that you had in the source region. 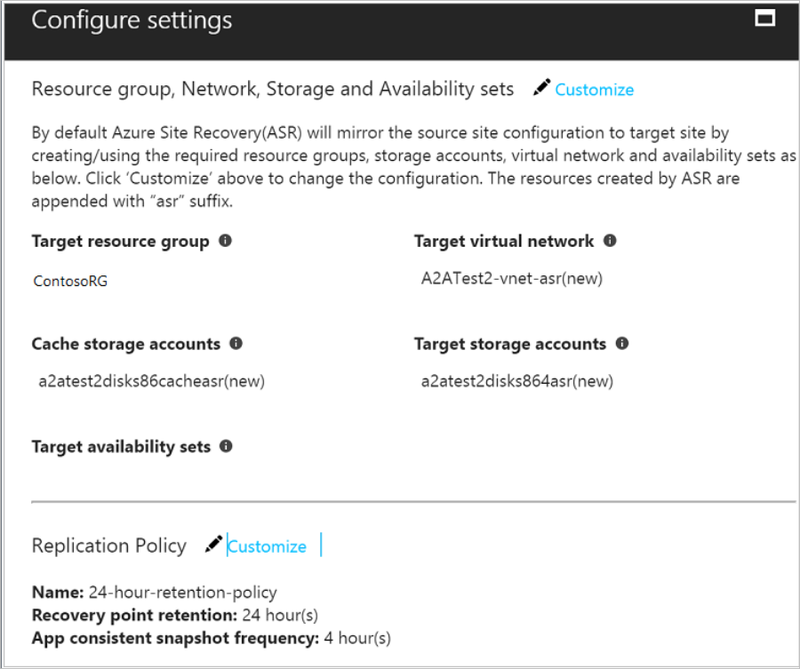 Azure Site Recovery automatically discovers and creates a virtual network when you enable replication for the source VM. You can also pre-create a network and assign it to the VM in the user flow for enable replication. As mentioned later, you need to manually create any other resources in the target region. For any other networking components, see the networking documentation. Manually create a non-production network in the target region if you want to test the configuration before you perform the final move to the target region. We recommend this step because it ensures minimal interference with the production network. The following steps show you how to use Azure Site Recovery to copy data to the target region. Select Create a resource > Management Tools > Backup and Site Recovery. In Name, specify the friendly name ContosoVMVault. If you have more than one subscription, select the appropriate one. Create the resource group ContosoRG. In Recovery Services vaults, select Overview > ContosoVMVault > +Replicate. In Source location, select the source Azure region where your VMs are currently running. Select the Resource Manager deployment model. Then select the Source subscription and Source resource group. Site Recovery retrieves a list of the VMs that are associated with the subscription and resource group. In the next step, select the VM that you want to move, then select OK. In Settings, select Disaster recovery. In Configure disaster recovery > Target region, select the target region to which you'll replicate. For this tutorial, accept the other default settings. Select Enable replication. This step starts a job to enable replication for the VM. Go to the vault. In Settings > Replicated items, select the VM that you want to move to the target region, and then select +Test Failover. Latest processed: Fails the VM over to the latest recovery point that was processed by the Site Recovery service. The time stamp is shown. With this option, no time is spent processing data, so it provides a low Recovery Time Objective (RTO). Select the target Azure virtual network to which you want to move the Azure VMs to test the configuration. We recommend that you use a separate Azure VM network for the test failover. Don't use the production network that was set up when you enabled replication and that you want to move your VMs into eventually. To start testing the move, click OK. To track progress, click the VM to open its properties. Or, you can click the Test Failover job in the vault name > Settings > Jobs > Site Recovery jobs. After the failover finishes, the replica Azure VM appears in the Azure portal > Virtual Machines. Make sure that the VM is running, is sized appropriately, and is connected to the appropriate network. If you want to delete the VM tha was created as part of testing the move, click Cleanup test failover on the replicated item. In Notes, record and save any observations that are associated with the test. Go to the vault. In Settings > Replicated items, select the VM, and then select Failover. Select Shut down machine before beginning failover. Site Recovery attempts to shut down the source VM before triggering the failover. Failover continues even if shutdown fails. You can follow the failover progress on the Jobs page. After the job is finished, check that the VM appears in the target Azure region as expected. In Replicated items, right-select the VM > Commit. This step finishes the move process to the target region. Wait until the commit job finishes. Go to the VM. Select Disable Replication. This step stops the process from copying the data for the VM. It's important to perform this step to avoid being charged for Azure Site Recovery replication. Delete all the relevant network resources in the source region that you listed out as part of step 4 in Prepare the source VMs. Delete the corresponding storage account in the source region. In this tutorial, you moved an Azure VM to a different Azure region. Now you can configure disaster recovery for the VM that you moved.